The Federal Triangle is a carefully designed area of Washington DC that houses some of the buildings of power within the city. This area was built as a stronghold for these offices, so that they could function as the city grew around them. The area takes covers ten office buildings, which all serve a governmental purpose and house their workers. The genesis for the area came in the early 1900s but it wasn’t referred to as the Federal Triangle until the 1930s. The $50million project combined all of the major federal buildings into one area for convenience and planning. Each of the buildings were assigned to members of the planning committee to oversee and they included architects and builders. The design of the area took years to plan, as so many buildings were vying for space and funding. Allocation for these buildings took place through the early 1900s, as all members of the committee squabbled for their space. Traffic and footfall for the buildings in their current states was also examined, as they factored into the design. The busiest buildings had to have the largest amounts of space for visitors and the rapidly expanding pool of vehicles. The design of the area was intended to be inspired by buildings in Paris, as this was the height of fashion at the time. One of the influences for the design of all the buildings was the Palais du Louvre, which many architecture scholars had studied. The first building to be started was the Internal Revenue building and the first stone was placed by philanthropist Andrew Mellon. Construction started and stopped many times through the project, as final designs were tweaked and space was reallocated. This led to the work taking many more years than originally thought and much more cash than anticipated. One lesser known fact about the history of the area is that it was the site of a protest most of the way through its construction. The Bonus Army, a group of veterans from previous conflicts, organised a sit in to oppose the construction of the buildings in 1932. President Hoover promptly dispatched cavalry and tanks to dissipate the thousands strong group of protesters. It was described by witnesses as one of the strangest sights in American history, as the current army attacked those that had once been among their ranks. Nowadays the buildings that make up this area don’t see this kind of conflict, they mostly just give office workers space to go about their jobs. 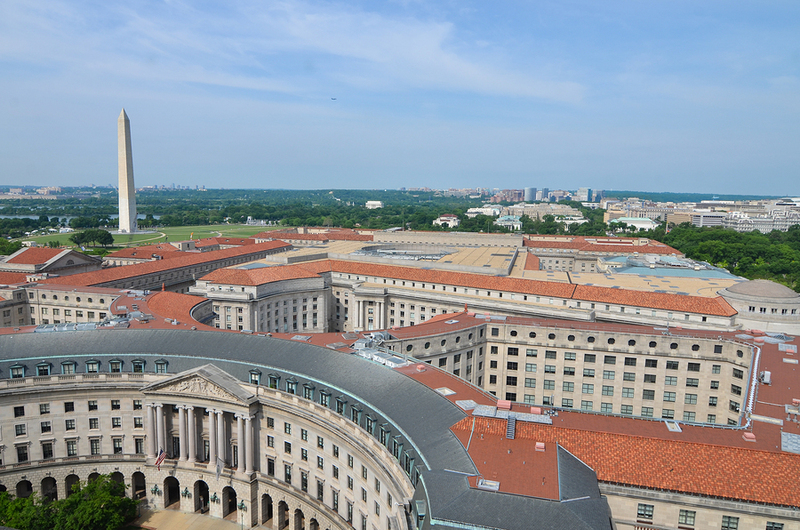 The Department of Commerce, Reagan Building, Wilson Building, Ariel Rios Building, Labor Building, ICC Building, Departmental Auditorium, Old Post Office Pavilion, IRS Building, National Archives, Apex Building and the Department of Justice are all housed in the triangle. Some of the biggest decisions are made in this area of land, with some of the nation’s most important documents found here too. The design of the Federal Triangle might have taken decades but many believe that the architects did a brilliant job of pulling all of these functions together.